1 Never loan tools to friends. 2 If it’s threaded, grease it. 3 You can’t properly adjust a bicycle that is dirty and not lubricated. 4 Perfect the art of changing a flat. No excuses. 5 Nylon tire levers are better than metal ones. 6 Measure twice, then cut. This especially goes for steerer tubes and integrated seatposts. 7 When disassembling something, keep track of the order in which you remove parts. It takes the mystery out of putting it back together. 8 Check tire pressure before every ride, especially if you’re running tubeless. 9 The three most important tools to have on a ride: a multitool with a chain breaker, a pump or CO2, and a patch kit or tube. 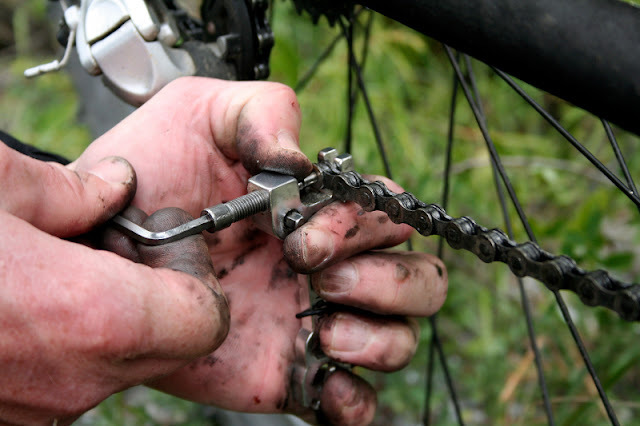 10 When tinkering with anything near your cranks, shift into the big ring first so you don’t mangle your hand on the chainring teeth. 11 Periodically check for bearing play in your headset, hubs, and cranks. To check your headset, squeeze the front brake and rock your bike fore and aft. For wheel and crank bearings, pull the wheel or crank side to side. If you feel a wiggle, your component needs an adjustment. Don’t ignore it, or the problem will get bigger and more expensive. 12 Using a torque wrench (see No. 81), check the tightness of your crank bolts every month. If you just bought a new bike, check them after every ride for the first week. 13 After you box your bike for travel but before you seal it, give it a side-to-side shake to note any loose or rattling parts. Then secure them. 14 Loctite Threadlocker­ Blue 242 is a must-have­ accessory for bolts that assemble using standard hand tools. It seals threaded fasteners and keeps them from rattling loose due to vibration.